You’ve been supermarket shopping for years, but are you doing it right? There are so many costly mistakes to be made in the supermarket which will soon hike up your bill. Worst of all, the supermarkets know exactly how to get you to buy and spend more, and will do almost anything to make it happen. No more! We’re sharing 11 common shopping mistakes to help you get clued up with the supermarket’s sneaky strategies and start saving money today! Heinz, Persil, Kellogs – are the big brands really the best? Most people don’t know, but many products from different brands are actually made in the same factory with the same produce, it’s just the recipes and labels that differ. It’s always worth trying out the stores-own products. In the case of toiletries, sweet treats and tinned foods, you could save a fortune by making the switch. Don’t turn your nose up at frozen food. Studies have shown that frozen food is just as healthy as fresh, and not only that but it lasts longer so its nutrition is preserved! Most people don’t know, but most meat and fish is actually frozen before it arrives on our shelves. This means buying frozen could actually be better – as it’s not already been defrosted before you purchase it. Best of all, frozen food costs considerably less than fresh! Just be sure to check the ingredients when buying meat and veg as it can contain added water. When you are buying fresh produce, a good indicator of value for money is the price per kilo on the shelf label. Don’t always presume loose produce is the best option – sometimes packaged fruit and veg will be cheaper. Get into the habit of comparing loose versus packaged and also different packaging sizes to ensure you get the best deal every time you shop. We’ve grown used to getting whatever produce we want, whenever we want, but the truth of the matter is that fruits and vegetables are seasonal, and shouldn’t be available all year round. Different vegetables, fruits and even varieties are less-available during certain times of the year. The shortage of supply pitted against the high demand hikes up the price, and means you’ll be paying more in the shop. Keep track of what’s in season and what isn’t and try to stick to it. Not only will produce be tastier, but cheaper too! Making a list before you set out will mean you only buy what you need. Be sure to look in the cupboards and fridge to see what you already have before you start planning what you’re going to bring home. Making a rough meal plan for the week will help you make your list and reduce waste too. We have a whole Meal Prep Guide that will help you get organised and start saving money on your shopping every week. Chicken breasts are often hailed to be the ‘healthiest’ choice of protein, but there are many other options out there worth considering. Other cuts of chicken, such as the thighs, are much cheaper and often tastier too! If you have a big family or are particularly into white meat, why not buy a whole chicken to cook on a Sunday and eat it throughout the week with salads and thrown into other meals – it’s a quick solution and will really save you a lot of money. Additionally, consider tinned fish such as sardines – which are usually less than 50p per tin – and cheaper cuts of red meat than your usual choice. If you really want to cut down, why not try going meat-free a few days a week? Beans and pulses contain loads of protein, and will work out much cheaper than your normal meaty meals. Check out our favourite Meat Free Monday recipes for some inspiration! I’m on offer look at me! Just because something’s on offer, it doesn’t automatically make it a good deal. If you weren’t going to buy that half-priced pack of cookies or 2-for-1 ice cream originally, buying it at its reduced price is still an extra expenditure. When buying things on your list, by all means, look for offers and deals. However, be aware of the offers at the end of aisles that are ideally placed to attract you. If it’s not on your list, give it a miss! Rewards cards might seem like a bit of a scam, but we’ve saved loads using them over the years and would definitely recommend trying them. 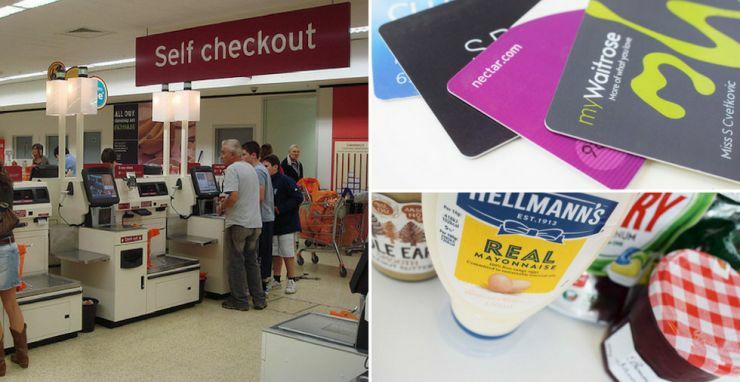 Supermarket loyalty cards will usually allow you to collect points which equate to money off your shops, give you access to exclusive offers, or even get you free perks such as magazines or tea and coffee. Get cards for wherever you shop regularly and start getting rewarded every time you shop. It’s always better to have an overflowing small trolley than a half-empty big one. Why? All that space will cry out to be filled. What you’ve already put in will look like less, and you’ll be more tempted to impulse buy and fall for those brightly-coloured offers. Always opt for a trolley that’s in line with your budget or list – if you’re only doing a ‘quick shop’, a basket is fine! Rumbling stomach? Step. Away. From. The. Shops. Just as it’s never a good idea to go to an all-you-can-eat buffet when you’re hungry, supermarkets should be off limits too. When you’re running on empty, eating pretty much anything seems like a good idea. You’ll be much less likely to stick to the task at hand – getting everything on your list – and instead focus on feeding your stomach. Before you know it, you’ll end up with a range of sweet and savoury treats in your trolley as a result of your uncontrollable cravings. From now on, time your shop so that it’s on a full stomach – after breakfast, lunch or dinner is best. Self-checkouts may not be practical for the big, weekly shop, but they’re seriously useful for smaller ones. Checking out all your items individually and watching the total slowly rise will make you much more aware of what you’re spending, and why. It will help you to really reevaluate the cost of things, whether you need them, and how you could spend less next time.